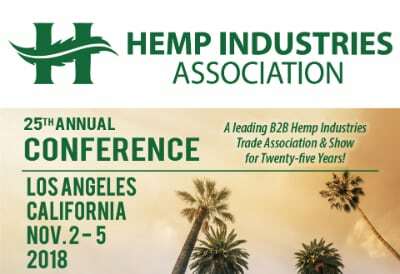 The 25th annual Hemp Industries Association conference (HIACON) will be held in Los Angeles, California at the LAX Hilton Los Angeles. The event will feature the Association’s Annual General Meeting on Friday, November 2nd followed by a retail-focused open exhibit hall day on Saturday, November 3rd and two days of continued exhibition, the industries awards dinner and education tracks for HIACON registrants only. Attention Members: The Annual General Meeting (AGM) is an important event that will feature the HIA’s annual report, state chapter updates, and elections for the Board of Directors as well as any referendums. If you are not a member of the HIA, but would like to become one sign-up prior to HIACON registration to save on registration but also to attend the AGM, visit www.joinhemp.org.